Through the first ten years of ICUS the main change was in size, with the number of participants swelling to 808 at the ICUS 10 in Seoul. The quality of papers and discussions varied greatly but still scientists were inspired enough to stay involved. They understood that the only adequate way to address the timely questions of this world and solve urgent global problems is from multi-disciplinary points of view. ICUS was valued as a meeting place for scholars to share ideas through mutual exchange, but a greater need was smoldering below the surface. There was a strong sense that the time for big change had come. The motivation for initiating major changes in ICUS arises from the participants' own realization. Although they were doing a lot of good work, unique in the sense that it was both international and interdisciplinary, the insights gained and the results of these gatherings weren't accessible to academic circles. From a strong desire to publish, Paragon House Publishers was born. From the fledgling press, two books were published: Mind and Brain and Modernization, and this served as the necessary catalyst to begin remodeling ICUS into a forum where the papers emerging could be published as books to disseminate the ideas worldwide. The organizing committee chairman becomes the editor of the resulting book, guiding the rewriting of papers to take into consideration the relevant data and perspectives arising from the roundtable discussion. We expect that six books will come out of this ICUS 12, each covering one topic of the six committees. With these important changes, the ICUS 12 became the culmination point of what has been sought for these past years. From the early conferences an indispensable foundation was laid. Progress continued with Dr. Morton Kaplan as organizing chairman and Richard Wojcik serving as executive director until new appointments were made this year. Richard has been promoted to publisher of Paragon House, and Dr. Kaplan takes the position as chairman of the Professors World Peace Academy annual International Conference, where his extensive work in international relations and foreign policy gives him especially appropriate qualification for such an important role. Dr. Kenneth Mellanby, Director Emeritus at Monk's Wood Experimental Station in Huntington, England, becomes the new chairman of ICUS, while I will work with him as executive director. These changes mark a transition stage with the 13th ICUS that Father calls "The Mellanby Era," which comes upon the foundation of success of the 12th ICUS. One difference to note is that while Kaplan comes from the field of political science, Dr. Mellanby's specialty is biology and zoology, and there will be a redirecting of ICUS toward more emphasis on the natural sciences although social sciences are still included. In the last few years a core of scholars have taken leadership who sense the frustration and understand that the ideal of ICUS hadn't been fulfilled. In his address to the scholars, Dr. Kaplan mentioned that the changes he strived to make were to bring us toward the fulfillment of the founder's ideal. What Father has told me is that he wants scientists to come to the point where they discover God's presence on the foundation of their own work. That should be one of the ultimate purposes of ICUS. In this sense, it is Father's desire that physicists, biologists, and other natural scientists become centrally involved. In fact, one of the committees next year, headed by Dr. Jean Charon, will be on Spirit and Science and the relationship between the two will be explored. With one organizer being an eminent and respected scholar, and the other a Unification Church member, we can stand as two pillars supporting an ideal of unity in cooperation and understanding between the academic world and the world of faith, represented by our movement. This year's theme, Absolute Values and the New Cultural Revolution, will continue for ICUS 13. 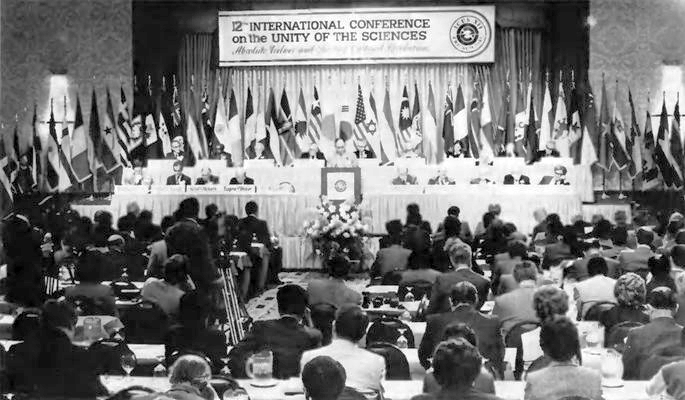 We realize the need for a central thread running through future conferences, and there was some concern that we never dealt sufficiently with questions of Absolute Values or the Unity of the Sciences, although a committee has addressed the Unity question. We are planning to have a major plenary speech on each of these topics, with different guest speakers each year. The chairman's role will be retained by Dr. Mellanby for two years, and some committee work will also span two years before a book is compiled. 1.) "Unity of the Sciences"
2.) "Scientific Knowledge: Principles, Application and History of Model Building"
3.) "Human Beings and the Urban Environment: The Future Metropolis"
5.) "Human Beings and the Natural Environment: the Ocean"
As the ICUS staff anticipates an important new generation of scholars to be attracted to the conferences, it has become apparent that more preparation time is needed to fit the conference into their own schedules. For ICUS 14 our planning will begin nearly two years in advance. Our decision to arrange more pre-ICUS meetings will mean better unity within the committees and help the organizers focus their purpose, goals and methods. Dr. Mellanby voiced the change that he anticipates when he told participants that we are going to have to work so that there's sweat and tears -- even more than before. Earlier he told scholars directly that if ICUS has not become what they have wanted it to become, then it is because of them; not because of the founder or the organizers. "If I were Rev. Moon," he said, "I would be somewhat disappointed that this conference has not yet become what it could become." In this spirit of responsible leadership that will really bring the right results. To look at ICUS from the view of unification, the whole purpose of Father's work in the academic world, in the religious world, the business world, and elsewhere, is to bring unity, knowing that diversity is very important -- we aren't talking about "uniformity" -- but unity within diversity. The Kingdom of Heaven can only come about when we include every aspect of human life -- both in this world and in the spirit world -- and that means the Kingdom of Heaven. We cannot exclude any aspect of human endeavor. When we are dealing with the crucial human problems that ICUS addresses, then how do we bridge the gap between different cultures and ideologies? The only way is to bring scholars from all fields. Environmental problems shouldn't be discussed only by environmentalists; there should be scientists, political scientists, philosophers, religionists and people in education involved because these issues affect every single one of us. And we cannot just look at things from our own local or parochial concern. As Americans we tend to look at things only from an American point of view. The problems may be seen very differently by people in a developing nation. Even questions of philosophy, education, medicine or technology must be seen from a global point of view -- and that's the unique contribution ICUS can make to the giant task of bringing one world of peace. James A. Baughman holds three Master's Degrees: physics, Religious Education from the Unification Theological Seminary, and a Master's in Political Science from Drew University. He is currently working on his doctoral dissertation in "Ethics: Religion and Society," which deals with the whole question of values. Jim says, "In a sense, I see myself as a Unity of Sciences person. Long ago I wondered how all these things might fit together, and now I'm given the opportunity to help put it together. I just hope I can make a contribution to ICUS and be able to speak effectively with professors from different specializations. Hopefully I'll be able to be a bridge between the scholars from the natural sciences, social sciences and the religious realm as well."